May 17, 2018, 11:59 AM · Welcome to "For the Record," Violinist.com's weekly roundup of new releases of recordings by violinists, violists, cellists and other classical musicians. We hope it helps you keep track of your favorite artists, as well as find some new ones to add to your listening! Bach’s son, C.P.E., considered among his father’s finest compositions: the six Sonatas for Violin and Harpsichord. 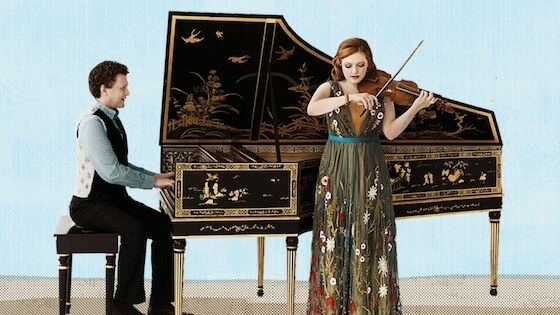 Violinist Rachel Barton Pine and harpsichordist Jory Vinikour record together for the first time on this album of J.S. Bach’s complete sonatas for violin and harpsichord. The album includes the sonatas as well as the Cantabile, BWV 1019a, a freestanding work that Bach originally conceived as a movement of the Sonata, BWV 1019. BELOW: Pine and Vinikour discuss their friendshp and new album.